We recently got an e-mail from a young man named Derek. Derek is 13 years old and came across our video “Meet the Entomologists of the Cockrell Butterfly Center” on YouTube. He is interested in becoming an Entomologist and must have been intrigued by what he saw. He had some questions for me about my career. I’m always happy to answer such questions and if you have an interest in a career in this field, maybe my answers will help you too! 1. This is a dumb one, but how much do they make yearly? This is certainly not a dumb question and can be an important issue, especially if you have student loan debt, like me! Yearly salaries vary, depending on what exactly it is you are doing. As an entomologist, you can work at a variety of different jobs. You can work in a museum like myself, or be a pest control operator, work for the government, in a lab, as a professor, the list goes on and on really. Whatever you do, you should not expect to make 6 figures and you may start off with a lower salary than you’d like, but the longer you are in the profession and the better you do, the more valuable you become and the more money you will make! I am very very happy with the money I make and most importantly, I LOVE my job. There is no amount of money that could replace that. Rest assured, if you become an entomologist, you will have a fun and rewarding career and you’ll make plenty of money! 2. Can you specialize in a specific insect? I am very fond and know a lot about the praying mantis. This also depends on how far you go in school and what career you choose. A lot of entomologists that go for their PhD. 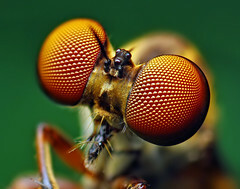 specialize in a certain insect and study them in a lab at their universities. I personally have a lot of freedom in my job. I have hundreds of different insects that I care for here and I can choose to study any one of them in greater detail. 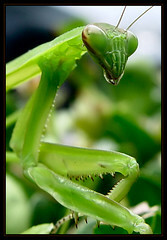 I also love praying mantises, they are definitely one of my favorites! I spend a lot of time raising them and studying them. I could at any time choose to do a research paper or even write a book about them if I really wanted to! In other jobs as an entomologist, you may be more limited, so if I were you I would do a lot of research on what type of entomologist you want to be. 3. Did you ever receive a sting or a bite that can kill you? I don’t care if it hurts. Well, you know Derek, insects are not as dangerous as many people think, and a lot of it depends on your own body’s sensitivity to certain types of venom. We do have a bee colony here, and if I were allergic to bee stings, a sting could probably hurt me or put my life in danger if I did not get the right kind of medical attention. Luckily, I’m not allergic to bees, but if I was, it would not discourage me from working with them because I know how to treat them respectfully and avoid being stung. And we take care to make sure our visitors can’t come in contact with them. We really do not have any insects here that are highly venomous, because there really aren’t many out there. Now other arthropods are a different story. We do also have arachnids such as spiders and scorpions and centipedes. All of these animals are venomous, but none that we have are deadly, although a bite from our giant centipedes can land you in the emergency room! I always take certain precautions when working with these animals, just like someone who works with venomous snakes. That being said, I have been bitten, scratched, poked, pinched, and even had venom spit into my eye. None of these were a big deal, I never had to go to the doctor or anything, but they were all learning experiences! How many insects do you work with or study a day? And for how long? Well, you could say millions if you add in all of the ants in my various ant colonies! Thank goodness every ant doesn’t need individual attention! I spend a large part of my day with basic care of the insects in the Insect Zoo and Containment Room where I have hundreds of insects. I spend a lot of time just feeding them, making sure they have enough humidity, cleaning their habitats, etc. That stuff is a lot of work, and unfortunately, doesn’t leave a lot of time for study. My day is also taken up with other things like writing e-mails, answering phone calls, leading tours, taking the bugs to schools for our outreach program, and just generally educating people about bugs. So that’s what I do with my time from 8-5 Monday through Friday. Now, like I said before, I can study certain bugs if I’d like to and I do make time for that because every year I get the chance to write a research paper and present it to other entomologists at a conference. This year, I’m working on a paper about the Giant Katydid (Macrolyristes corporalis) which is such an amazing insect. I’ve already written a couple of blogs about it. To me, this career is very unique because I’m not just stuck in a lab. I am kind of like a teacher, consultant, scientist and caretaker all rolled into one, which makes for a very fun and interesting job! I even get to travel! In 2008, I got to go to Costa Rica to see bugs in the rainforest, it was awesome! I learned all about bugs in college, but I’ve learned far more here from actually getting to work with live insects and observe their life cycles and behaviors. A lot of labs are full of dried specimens of dead bugs, which can be cool too, but I’m very happy to be here! 5. Finally, how would I become one? To be honest, I don’t know many colleges or schools that practice entomology, and you just don’t see ads in the paper for entomologists! Good question! Well, I went to Texas A&M for college and it is the only University in the state of Texas from which you can receive a degree in Entomology. I’m not sure where you live, but in most states, there is at least one university that offers this type of degree. The internet is a great resource for this, just google degree programs in Entomology and that should get you started. Next, you will have to decide how far you want to go, I only have a bachelors in Entomology just because, for now, I can’t afford anymore college, but I plan to get a masters someday soon and eventually a PhD. In college, you will have so many resources available to you that will help you figure out what jobs are available and what you want to do. Like I said, there are so many different things you can do with a degree in Entomology. These jobs can take you anywhere in the country, even several places around the world! You can even do my job almost anywhere. Most states in the U.S. and even countries in Europe, Asia, Australia and South America have museum with insects zoos and butterfly houses much like ours and they always need good Entomologists! Well Derek, I hope this helps you! My best advice is to keep doing what your doing and studying insects. You may have people, even family members and friends tell you that Entomology is not a good career choice. Only because most people don’t know much about Entomology, or even bugs in general, but don’t let that discourage you. If you work hard and do well in school, you can do anything you set your mind to and I’m sure you will be a successful and happy Entomologist, just like me! If you have anymore questions, or any other budding entomologists out there for that matter, please feel free to contact us by sending an e-mail to blogadmin@hmns.org. Happy bug watching! I want to do field work because i prefer the outdoors to a lab. What kind of research would some one be looking for in the wild? Hi Lucy! I’m so happy to hear that you’re interested in a career in Entomology as well! This question would be hard to answer right now because as I said, the possibilities are endless. For someone like you, this will depend on where you go to college and what you decide to do while there. When you are in college, you will discover many options and opporunities to do field work. Most research is done on insects that have a major effect on humans, such as mosquitoes. However, you can do research on any insect if you can persuade someone to give you a grant for it! Just keeping learning as much as you can and who knows what will be going on in the world of Entomology by the time you get to college in about 5 years. Use your imagination! After passing 12th standard, i studied zoology as my subject for bachlors degree and Entomology as my special paper for masters degree. i want to go further with my study subject (as a student or as an intern) . please suggest and help me. How many years do I have to go to college for to become one? So I’ve wanted to be an entomologist since I was a very little girl. Right now I’m taking a required public speaking class and our first speech is on our future career choice. During our speech we have to answer several questions about our career and my last question I have left reads, “What kind of benefits does this job offer? (You need health insurance! )” I know that’s a dumb question that doesn’t exactly relate to entomology, but I need to answer the question to get a good grade on my speech. Thank you for the help! This is a very good question, but, the type of benefits you will receive depend completely on who you work for and if that company/zoo/museum/University offers health insurance, paid vacation, a retirement plan, etc. I work for the Houston Museum of natural Science and they certainly do provide those benefits for their employees. I would definitely recommend that when you are looking for a job, that you seek an employer who also offers those types of benefits, it makes life a lot easier! Hello! So I’ve always had a passion for insects as well as traveling. Are there many opportunities for traveling with a degree in environmental science or entomology? Hi Sophia! Well, there are definitely opportunities for travel, but it all depends on what exactly you do in the field of entomology. For example, if you work for a zoo, or museum, you can possibly travel for conferences. If you work for a university, maybe you will have a grant that allows you to travel for research. If you work for the U.S. Department of Agriculture, you could travel to do inspections. So, it really depends on a lot of factors! Hello! I am a 16 year old junior who is fascinated by the Insect Order Mantodea, much like Derek. I am having trouble finding how I can specialize in studying these insects because I cannot find an entomological career that would allow me to do so. Do you know a way for to be able to specialize in studying mantids? So recently I found out what an entomologist is and what they do and I sort of taken an interest in it. I was wondering what should I know about the subject and how can I learn more. Also, is there websites that any of you guys can recommend to me to learn more about the different types of insects. Another thing is that if I do end up becoming an entomologist I want to study either beetles or butterflies. 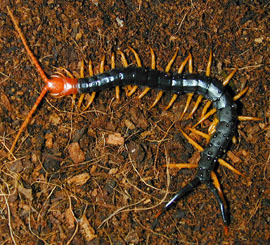 I am 15 years old and have worked with many insects in the past but my all time favorite was millipedes I am not able to work with centipedes because they are a little too aggressive for me is there any way that I could be an entomologist and work mainly with millipedes and pill bugs. Hi! I am currently an oncoming sophomore in Entomology at Texas A&M. It is a little bit early but I do not know when or how to start the process of finding internships or explore the career paths in the entomology field. I noticed you are also an Aggie so that is why I would like to know how you utilize the school’s resources to explore the Entomology careers. Thanks and gigem for the help in advance!